Over the past few years there have been many strategies proposed and articles written on whether customers would prefer to view and pay their electronic bills at a Biller’s website, or aggregate a number of bills through their Bank’s Internet site. These two approaches are known as ‘Biller Direct‘ and ‘Bank Aggregation‘. Various analysts including Gartner, Forrester and the Tower Group have researched this in great detail. Today we look at a third strategy: ‘Customer Aggregation‘ ~ The one that we believe will come to dominate the US market within a short period of time. Until the early 1990’s, before the age of email, all communication / post was conveniently delivered to our homes and offices. This mail could be divided into four groups: Business Mail, Personal Mail, Bills and Junk Mail. Your in-tray and postbox at the bottom of your driveway, served as the aggregator of all your communication. You did not have to do anything to have it delivered and you certainly did not have to go anywhere to fetch it. Let’s fast forward to March 2005 ~ Three of the four types of communication; Business Mail, Personal Mail and some Junk Mail, are now predominantly found in your email inbox. The one type of communication that is conspicuously absent are your Bills. Then link from an email notification through to their website to view & pay bills (phishing is going a long way to making consumers very wary of this strategy). In some cases, banks are providing the ability to aggregate certain bills within their Internet Banking portal. These can be both time consuming and unnecessary processes. The biller requests that customers no longer receive their paper bills (that are needed for personal records) and that the bills are downloaded if required. This is suitable for the biller, but not really convenient for the customer. In order to offer meaningful convenience to customers, billers and banks need to get as close as they can to the familiarity of paper billing – electronically; by delivering bills or bank statements directly into their customers’ inboxes. Just like a piece of paper, the customer does not have to do anything to receive it. Billers can then take advantage of significant cost savings by truncating paper sends. 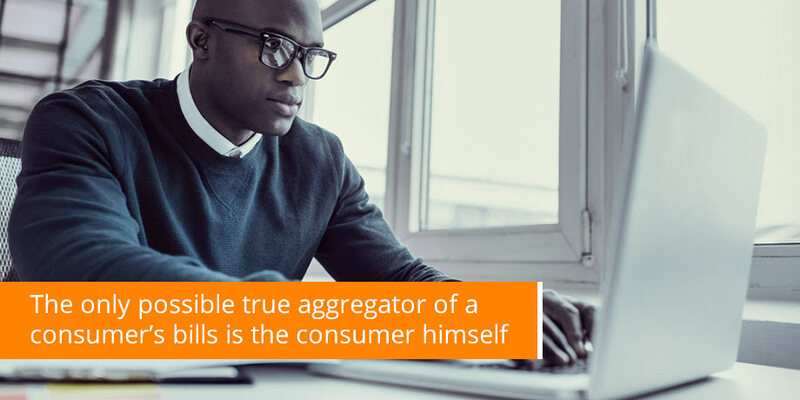 The only possible true aggregator of a consumer’s bills is the consumer himself. As long as biller’s rely on customers to sign up for eBilling and only offer internet self-service, adoption rates are going to remain low and widespread paper truncation is not going to become a reality. The ‘inbox’ is the postbox of this century and it is only a matter of time before all communication is delivered directly there – bills included. We’d love to hear your views on this.